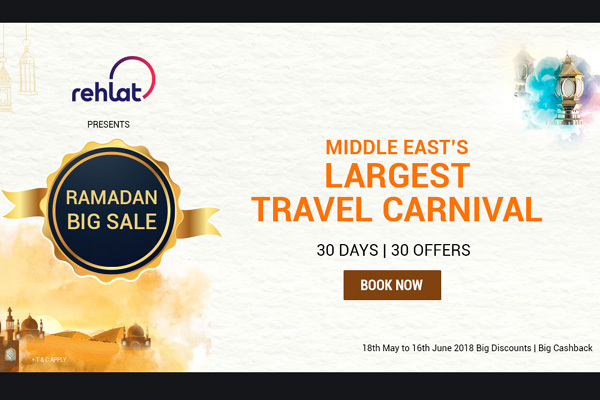 Rehlat, one of the Middle East's fastest-growing online travel agencies, marked the start of the holy month of Ramadan with the unveiling of its new logo and a special sale, offering attractive prices and discounts across flights & hotels. From May 18 to June 16, the sale will offer Karam cashbacks, offers, and attractive discounts across flights, hotels and destinations across its multiple platforms – desktop, mobile app, and mobile-site. The Ramadan Big Sale at Rehlat offers users a 5 per cent instant discount and up to 20 per cent Karam Cashback. Users have to use the coupon 'Kareem' to avail the offer. Being the first loyalty reward points of the Middle East, Karam has gained the market foothold in few months of launch, considering its umpteen benefits. The refer and earn scheme to earn Karam also has become a huge hit and an easy way to earn Karam. Karam has become the preferred mode of payment for many considering the many advantages it offers. Karam has been the most widely used loyalty points in the Middle East with over 60 per cent of Rehlat’s users benefitting from Karam Cash, said Amanpreet Singh, chief operating officer of Rehlat. “We are strongly focused on strengthening our services and have constantly been enhancing our systems to offer a seamless booking experience to our customers,” added Aman. Rehlat believes in giving its user more than transactional services and has, thus, launched two new products. The first is a travel bot which works on Facebook messenger platform where users can easily find their regular queries like managing tickets, baggage allowance, Karam cash balance or cancelling a booking. The second product is the inspiration blog, which allows the users to experience curated information about destinations food, culture, must do’s, or travel hacks; so that travellers from the Middle East & Africa can be well informed about the destination they are travelling to or can plan their travel by getting inspired by these curated write-ups.